Halamish massacre terrorist convicted of three counts of intentional manslaughter, two counts of intentionally causing death. The military court today sentenced Omar al-Abed to four life sentences for the massacre in Halamish (Neve Tzuf) last summer. 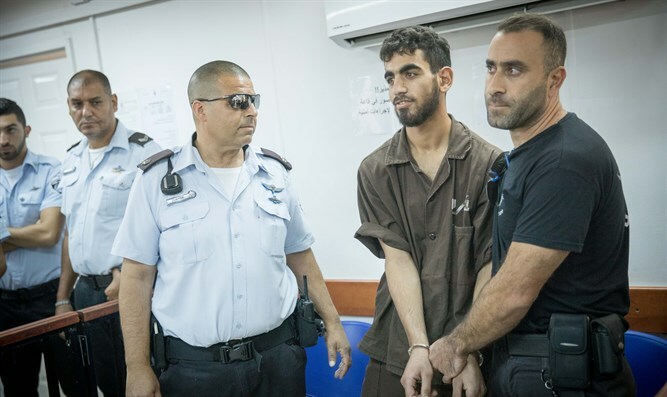 He was convicted two months ago of the murder of the three Salomon family members and the serious indictment included three counts of intentional manslaughter (the equivalent of a murder offense), two counts of intentionally causing death, incitement, and other offenses. The Salomon family members Elad (36), his sister Chaya (46), and his father Yosef (70) were slaughtered by 19-year-old al-Abed as the family ate their Friday night dinner at Yosef's home in Neve Tzuf last year. After the conviction, Galatz reported that the State objects to demolishing the terrorist's house. According to the report, the State supports only destruction of the lower floor inhabited by the terrorist and not the entire house. Despite the fact that five members of his family were convicted last August of failing to prevent the attack, the State decided to advise the Court that in its opinion, demolishing additional floors where the terrorist himself did not live should be avoided. Regulation 119 of the Defense Regulations, by authority of which the State destroys terrorist's homes, explicitly permits confiscation and destruction of the entire building in which a terrorist lived, regardless of the part of the building in which he lived. Over the years, however, Supreme Court justices have eroded the regulation's efficacy and imposed many restrictions on its practical implementation. At the end of July, the terrorist entered a private home in the Binyamin village where the Sabbath meal was attended by 10 people, three of whom were killed in the tragedy. A soldier on leave who heard the incident arrived with a weapon and eventually shot the terrorist. In addition another wounded woman who was evacuated to Jerusalem, the other residents of the house were uninjured physically.